3 1/2 years ago I discovered the online vanilla bean company Beanilla and have been in love with their beans ever since! When I moved to Germany, getting my hands on local affordable, high-quality beans was impossible so I was excited to have found Beanilla. Before I go on… if you’re here for the GIVEAWAY scroll to the bottom for all the details! I reached out to Beanilla a couple months ago and expressed to them how much I loved their beans and would love to partner with them for a post on JavaCucpake! I have been using their beans in my homemade vanilla extracts as well as in all my vanilla recipes. Every time I split open a Madagascar vanilla bean the aroma fills my kitchen and I go to my happy place! Since I make all my extract in bulk, Beanilla and I decided that I’d create for you a “How to Make Homemade Vanilla Extract in Bulk” tutorial for you. This tutorial will feature three distinct Beanilla beans paired with three different liquors. I really hope you are able to get a lot of helpful information from this tutorial! Vanilla extract is super simple to make and it really is so amazing in place of store bought extract. Once you start making it yourself, you’ll never go back to imitation! I created two video tutorials to help you make homemade vanilla extract. This first video below is longer with more details about the beans and alcohol I used. The video at the bottom of this post has been edited to only include the specifics of making the extract. Ugandan vanilla beans and spiced rum extract – Strong, creamy, rich tones of chocolate and caramel beans paired with a caramel spiced rum produce a bold vanilla extract strong enough to hold up to any chocolate recipe. Start with one type of beans and the alcohol paired with it. 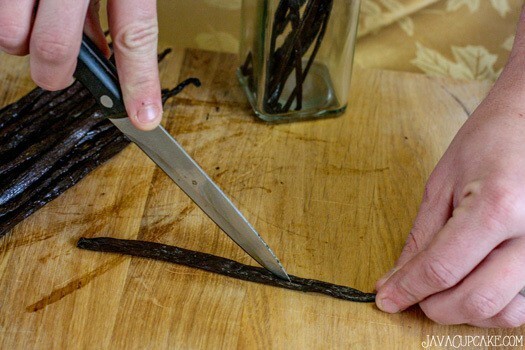 Prepare those vanilla beans by using the straight edge of the paring knife and pressing the vanilla pod flat evenly distributing the beans inside the pod. Split the pod in half the long way. Repeat until all the beans are split. Place the beans into the clean, dry glass jar and pour the alcohol until it reaches the neck of the bottle. Place the cork on top and shake gently. 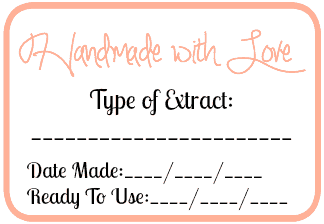 Add a label to the jar noting the date you made the extract. Store the jar in a cool place away from direct sunlight for a minimum of one month up to four months. Repeat this process with the two other types of beans and their corresponding alcohols. Download these bottle labels made exclusively for JavaCupcake readers by Rachel of Glitter & Bow. Print the labels on sticker labels and adhere them to each bottle. 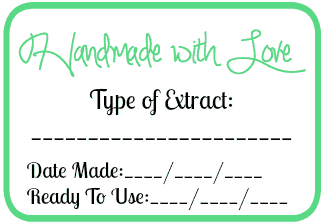 Write in the type of extract you made along with the date made and when it will be ready to use. Alternately, you can print the labels on regular paper and use double sided tape to adhere them to the bottles. 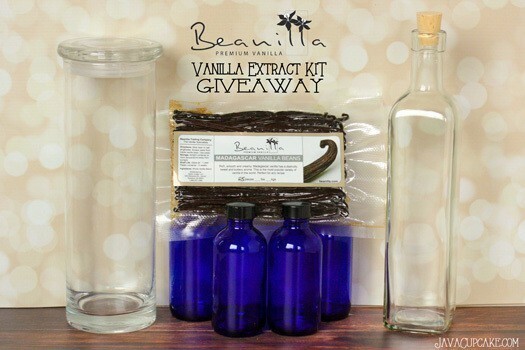 Thanks to Beanilla, I’ve also got a custom designed Vanilla Extract Kit exclusively for one of my JavaCupcake readers! I just discovered vanilla making- and Beanilla- so finding your blog and this post is a dream come true. I had no idea you could make vanilla so many different ways, thanks for teaching me something new ! I LOVE Beanilla and these 3 versions of vanilla extract are so fantastic!! I would make a vanilla cake with my homemade vanilla! Love the bottles you use to make the extract in. Can’t wait to try the Vanilla Smirnoff recipe. Thank you. 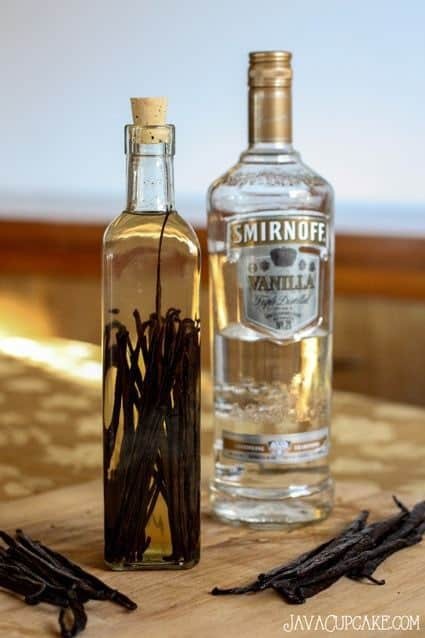 I’ve never made my own vanilla extract but I’d love to. Besides using it in quick breads, I’d also add a little to homemade whipped cream. I haven’t made my own vanilla before but I hear it is far better than store bought. The first thing that I’d make is Vanilla ice cream! I’ve never made my own extract, but I can’t wait to try this! The worst part will be waiting for it to be ready. I think I’d first make a vanilla cake with vanilla buttercream. I have never made it before but I think one of the first things I would make with it would be home made ice cream, then cake and frosting to go with it. 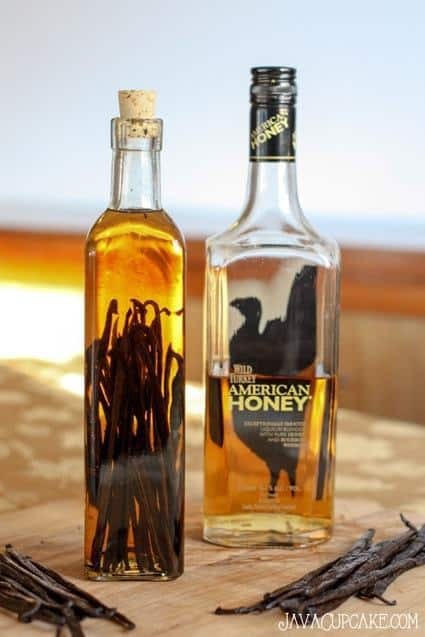 I have never made vanilla extract but since vanilla is my favorite flavor and I have a hard time getting things”vanilla enough” I am very interested in making my own. It’s been on my to-try list that last few years but I still haven’t done it. Maybe a starter kit is just what I need! 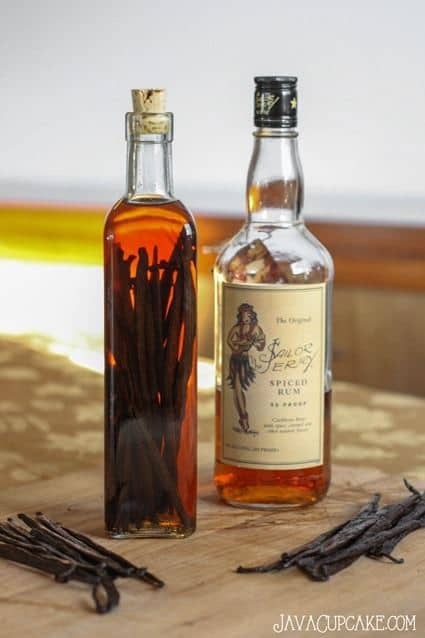 I’ve never made homemade vanilla extract, but I would love to try some. I would make cookies, biscotti, scones, etc. with it. Thanks! I am so glad that you shared this Betsy. I never knew that you could make your vanilla and then with so many combinations. I am so ready to try these. Thanks again for sharing. I would use it in my cheesecakes, for starters. Sounds really good and I really would like to make my own. 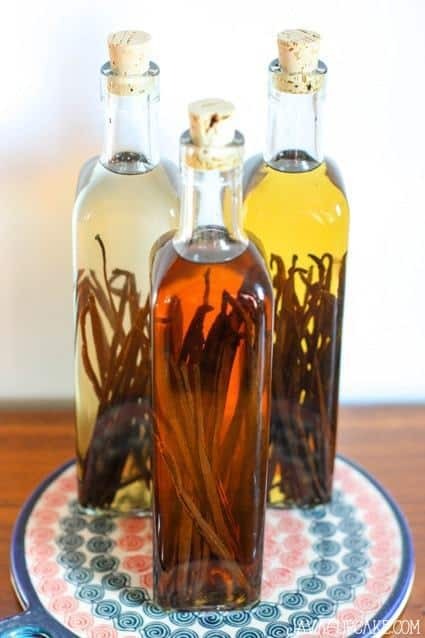 I have made my own vanilla extract in the past, but did not realize that different kinds of beans/alcohol made different flavors of vanilla extract! I have made vanilla and I love doing it. I use it for baking all the time, especially for my vanilla creme brulee. I’ve never made vanilla extract before. The first thing I would make with it is vanilla flavored sugar cookies. I love to bake and decorate sugar cookies. I have made Kahlua from beans but never and extract, Hmmm, what would be first….vanilla cake with vanilla bean frosting. Homemade banana pudding with homemade vanilla wafers! Yummy! Just made my first batch of homemade vanilla a few months ago for my Christmas baking. What a difference in flavor. Thanks for a fun giveaway. Happy Thanksgiving! I’ve never made my own extract but I’ve used homemade and I’m so excited to make my own! I’m excited to make ice cream and cheesecakes with homemade extract. I have not made vanilla yet, but if I did I would bake cupcakes first. I’ve never used actual vanilla beans , just paste. I would love to make vanilla sugar! Nothing can measure up to a vanilla bean! I LOVE them things! I’ve been wanting to make my own vanilla, I bake a lot, we make all our food from scratch, so things like pancakes use vanilla. I need to get going and make my own! I never have made my own extract but this year I will. I would use in a coconut cake or some cinnamon rolls. Oh, all kinds of things. I’m the baker in my house and I use vanilla in nearly everything I bake. This would be a great help as I can refill right at home. Please enter my name as a possible winner. Thanks! I’m sooooo doing this. I love vanilla in everything! Amazing that you can produce different flavors of vanilla. I have been making my own extract for myself and for gifts. My favorite combination is the vodka with the Madagascar Beans from Beanilla. I tries the Bourbon but did not use the honey one you did and it is still too much bourbon, not enough vanilla! I’ll definitely use the one you recommended instead from now on. What do you do when the liquor levels drops after use? Do you refill and leave the beans alone or do you add more beans? Do you ever remove any beans? I made vanilla extract for the first time over a year ago using Beanilla beans. It’s so much better and cheaper than what I can buy in the stores. I really want to make it using the vanilla vodka. I bet it smells amazing! I love making homemade vanilla extract. I use it for all my baking needs. I have heard about making one’s own vanilla but haven’t had the time (or remembered) to look further into the process. Your instructions are fabulous! 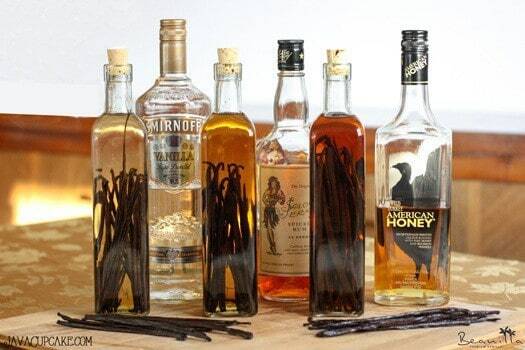 I do not like the vanilla found in the grocery store and am going to do this for Christmas gifts this year! I have been making vanilla for a few years. I have one for baking and one for candies! Would love this set to share with others! I’m making my first batch of extract now and can’t wait to bake with it. I use it in almost everything! I didn’t realize extracting Vanilla was so simple! Thanks for post. i have never made vanilla extract before. I think the flavor would be so much more intense though and would love to try it in half a dozen recipes!